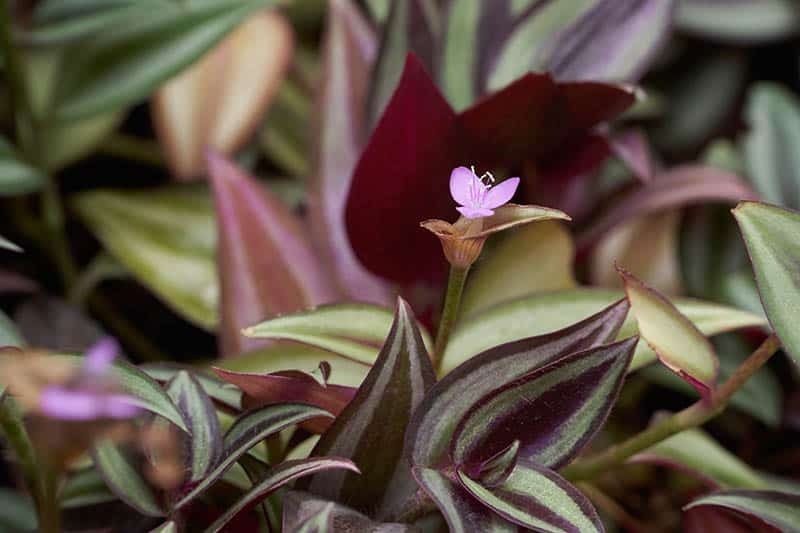 The name, “Wandering Jew Plant,” is a common name used to refer to species of Spiderwort. It is probably a description of the plant’s tendency to escape into shady, wet regions. There are three such species to which the name is applicable. They include the following varieties: Tradescantia zebrina, Tradescantia fluminensis, and Tradescantia pallida. These three are fairly common ornamentals that are typically native to Mexico, South America, and Central America. Wandering Jew plants are identifiable by their heart-shaped leaves, which, depending on the species will have distinct leaf colors, stripes, and sheens. It is a succulent, trailing herbaceous flowering plant with blooms of only three petals. All three species of the Wandering Jew plant can be grown either outdoors or indoors. In its natural habitat, be it in Mexico, South America, or Central America, it has become notorious for ‘wandering’ into shady wet regions, as we alluded to earlier. This is due to the presence of so many short joints on its limbs that compel the stem to grow in directions different from the one it followed in the previous section. This is also why it is known as an invasive plant. It can thrive on virtually any surface with the minimal requirements for growth and, before long, will eclipse almost any plant growing in the same vicinity. If you do not take care to nurture it properly, it could become problematic as even an inch of it will continue to propagate left unattended. In this guide, we will be considering how to grow it as a houseplant. Here’s a brief overview of the three species of this perennial plant. This species is native to Mexico and gets its binomial name from its zebra-like leaves. T. zebrina leaves are paired, creamy white in the middle of each half, and silvery green on the edges. The leaves develop a purple patch on the upper surface and underneath and are asymmetrical at the base. Its flowers are light purple. This Spiderwort species is also native to Mexico and is arguably the most popular of the three. Its leaves are sheaths, clasping, ciliate, and oblong. T. pallida leaves are deep royal purple on the upper surface, and underneath are violet and pink. Its flowers are light purple. This species is native to South America. T. fluminensis leaves are ovate to oblong-lanceolate leaves that are dark green or flushed purple beneath its bright white flowers. 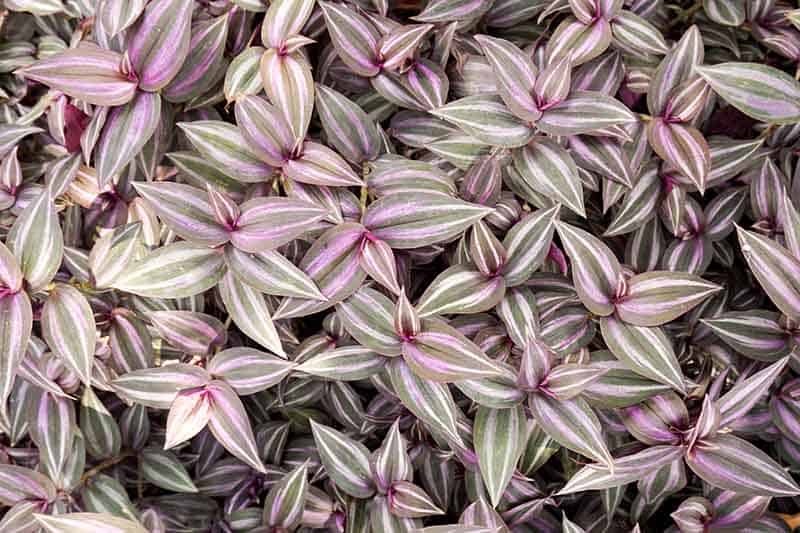 All Tradescantia species, when cultivated as houseplants, depend on a steady exposure to sunlight to preserve their variegated leaves or else they will begin to fade. The number of flowers that bloom is directly related to the amount of sunlight the plant receives. Keep in mind, though, that this must be indirect sunlight. If the plant gets too much sunlight, the leaves begin to scorch before long. This is something you will need to be mindful of if you decide to cultivate the plant outdoors. The temperature requirements for growing Tradescantia zebrina, Tradescantia pallida, and Tradescantia fluminensis are the same. Grow any of these species in temperatures between 65 degrees Fahrenheit and 70 degrees Fahrenheit. The plant generally does better under warmer temperatures, but as long as you don’t go below 50 degrees Fahrenheit, your plant should be fine. Below that, there is a great chance of the leaves getting discolored or, worse yet, damaged. The Wandering Jew is classified as an invasive species for the and is hard to eradicate if their growth outdoors proceeds unchecked. It is, therefore, not surprising that they can thrive on little water. They also do well in waterlogged terrains. That is not to say that you should go about watering irregularly. Rather, to ensure that the plant grows robustly, you should water it at regular time intervals in the growing season in summer, and then appropriately reduce the amount you use in winter. The idea is to use soil that contains a lot of organic matter to grow the Wandering Jew Plant. That is not so say it will not do well if you choose to use a regular houseplant compost mix. It just grows better when it has a lot of organic matter to draw from. This is something that you could create all by yourself. You are going to need the following ingredients: Humus or peat, garden soil, a scoop of rich organic compost, coarse sand or Perlite, and a little limewater. Once you have this, all you will need to be on the lookout for is how well it drains and how well it retains water. Tinker with it until you are satisfied with the end product. As of writing, there is no consensus when it comes to how much fertilizer you should use. You will be safe, though, with using a water-soluble fertilizer on a bimonthly basis as long as you do not fail to dilute it to fifty percent of the normal strength. If you apply fertilizer at the normal strength, you run the risk of overfeeding the plant, which is bound to result in the plant losing its variegated pattern if you do so over a sustained period. It is inevitable that as long as you care for whichever Spiderwort species you decide to purchase and grow, the plant will eventually outgrow the pot. Once it does, you will need to figure out how to re-pot it. How exactly should you go about doing that? For one thing, you should do it no more frequently than once a year. It is best that you give this perennial herbaceous plant’s roots enough time to grow. As a reminder, it is not as if the Wandering Jew plant will die if you do not re-pot it. It is built to survive almost anything longer than most other houseplants once planted. 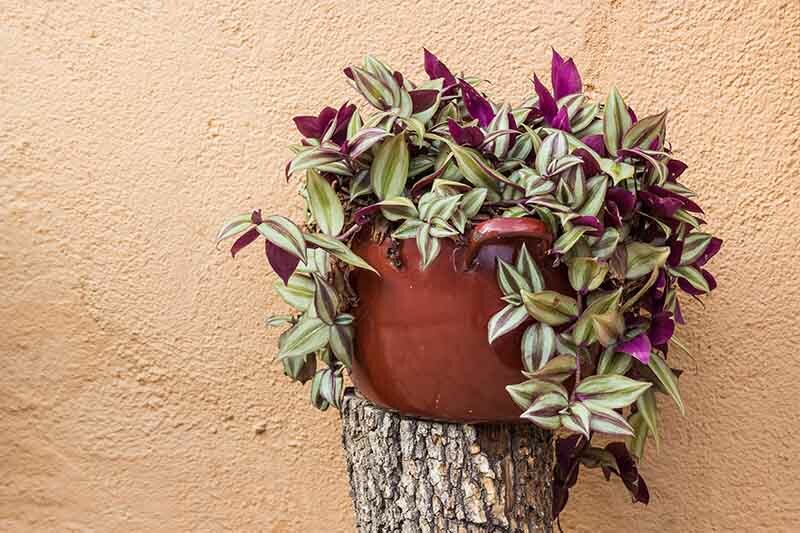 If you were to grow your Wandering Jew plant in a hanging basket, for instance, it would be best if you do your utmost to ensure that you re-pot it. When re-potting, make sure you do not rely on soil made from dirt or containing too much organic manure. The invasive nature of this ornamental plant makes it necessary for every gardener to be prepared for pruning if they decide to grow it either indoors or outdoors. This is due to the presence of so many short joints on its limbs that compel the stem to grow in directions different from the one it followed in the previous section. When pruning, take care to slice off the stems to the point where you will be able to pinch off the stem tips. This will ensure that the upcoming shoots, usually two in the case of the Wandering Jew Plant, will grow to give the plant a wider appearance overall. As far as vertical height is concerned, you would be hard pressed to get your Wandering Jew houseplant to grow taller than six inches even if you take the best possible care of the plant. Even if you follow all of the aforementioned steps to the letter, the only growth you are going to observe is that which happens with each individual stem. In that case, you might be able to see growth of up to six feet. This is especially desirable if you go the hanging basket route. There are few ornamental plants grown as houseplants that grow more readily and effortlessly than the Wandering Jew Plant. That is why it is imperative to make judicious use of your stem cuttings after pruning as many times as you desire. It will interest you to know that you do not need to do any special preparation of the cutting, such as drying it overnight or applying any special kind of growth hormone to the stem to get started. If you have a fresh compost mix ready for potting, all you need is an inch of the stem with one leaf, and you are all set. All that is necessary from that point forward is appropriate watering and feeding with fertilizer in the manner we described above. You are bound to see results in a few weeks’ time. 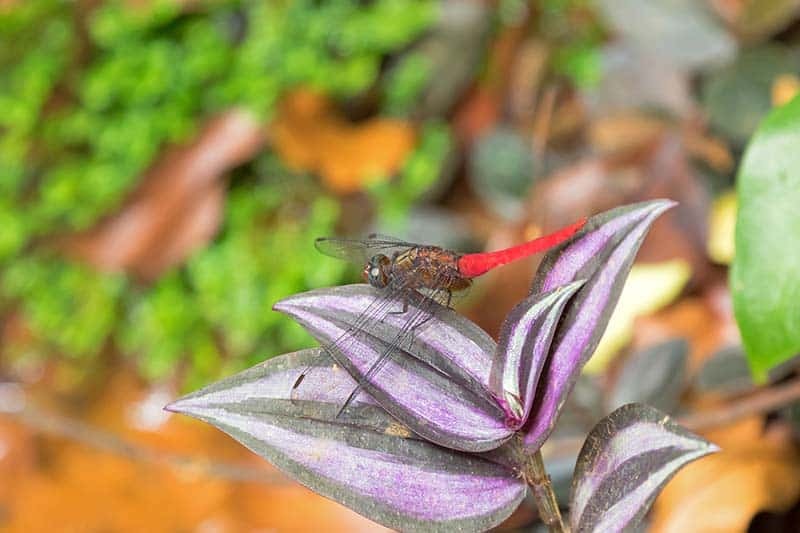 We have touched on this above, but for the sake of emphasis, you will observe light purple flowers with three petals if you purchase and grow Tradescantia pallida or Tradescantia zebrina. If you are working with Tradescantia fluminensis, then the flowers will be bright white. There is no timetable dictating when they should appear. As with almost any ornamental plant grown as a houseplant, falling leaves are typically a function of age. When you observe that the leaves of your Wandering Jew have begun to fall off much earlier than they should, it means you have been subjecting it to less water than is required. That rarely happens, though, because this plant is a survivor. But with too much negligence, anything is possible. 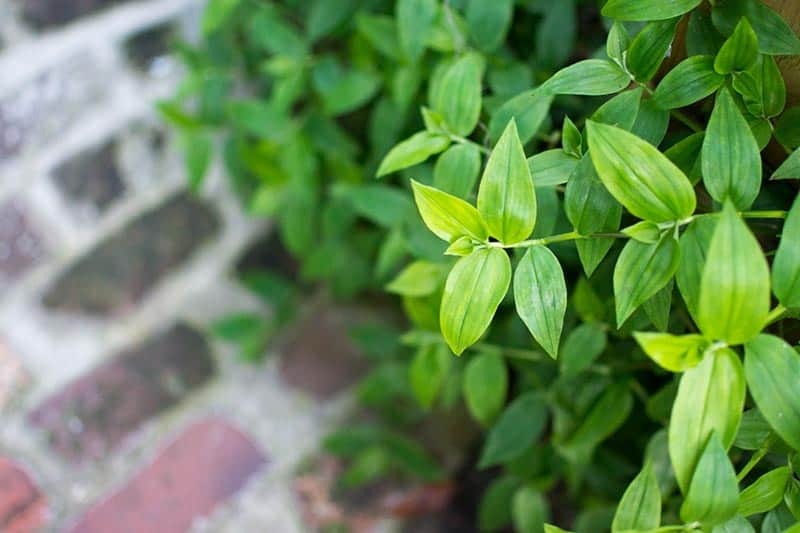 We have already mentioned the possibility of the leaves of the Wandering Jew losing their variegation if you apply too much fertilizer. If you have that under control and you see the leaves going green, then you should probably expose it to more sunlight. Aphids and spider mites attack the Wandering Jew, but of the two, the latter is the most formidable obstacle to robust growth. We have said that you should grow the plant in warmer temperatures and under direct sunlight. What we have not said is that spider mites also love both of those conditions. Wash your plant off with water to combat this pest. If that is not enough, you should probably get a pesticide. As we alluded to earlier, the Wandering Jew is prone to suffering from root rot if it is taking in too much water. It could be taking in too much water if you water too much or cultivate it in soil with high water retention. Make sure that you only water it when the soil is dry, and ensure that the excess water can drain through the pot or into your groundwater. For indoor plants, empty the saucer once the water drains to prevent the soil from re-absorbing the water as it dries. Growing and caring for the Wandering Jew Plant as a houseplant can be a rewarding experience if you follow the instructions we have outlined in this guide in addition to channeling your inner gardener instincts. Take care not to grow this plant in a small garden bed or mixed pot because its invasive nature makes it hostile to such environments. It will overshadow and crowd out everything else you have planted. If you manage to get the plant the right light, temperature, water, fertilizer, and soil requirements, you will be able to sit back and enjoy the beautiful foliage of this perennial plant in addition to its light-purple or bright white flowers. You can observe this in a hanging basket, flowerbed, or large pot. It will complement your indoor or outdoor décor beautifully. You can also take advantage of the length of the stem for decorative purposes because it allows the plant to wrap itself around objects. To achieve this look, select any solid material in your home or office and attach the stem to said object with the aid of a string that does not cut the stem. You will be amazed at the beautiful aesthetic in a few weeks.